First brew your tea of choice. I am a huge chai fan and one of my friends gave me this loose-leaf chai blend from Teavana that I decided to use. After brewing the tea, pour it into your glass of choice and add as much honey as you would typically use for a cup of tea. Next pour in a shot of the alcohol. Typically hot toddies are made using whiskey but this past weekend I picked up some liqueur full of herbs and spices which I figured would add a nice touch to my hot toddy. The quantity of alcohol can be adjusted based on how strong you want your drink. Mix until honey is dissolved before adding lemon juice for a bit of flavor. 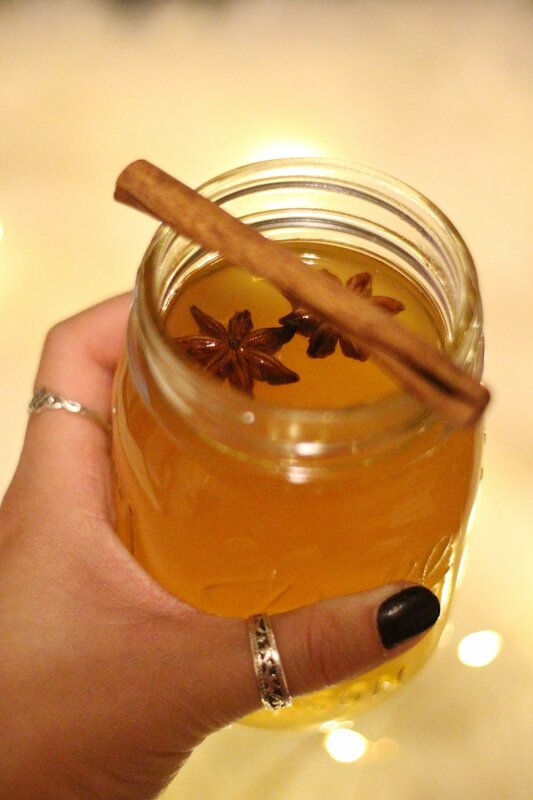 Finally, garnish your hot toddy with a few star anise, a cinnamon stick and if you wish, a slice of lemon and then drink up!